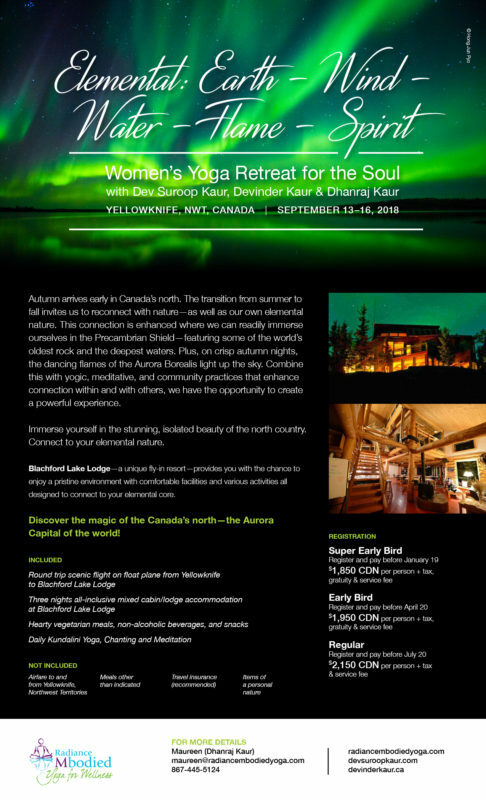 Hosted and organized by Radiance Mbodied Yoga located in Yellowknife, NWT. Autumn arrives early in Canada’s north. The transition from summer to fall invites us to reconnect with nature – as well as our own elemental nature. This connection is enhanced where we can readily immerse ourselves in the Precambrian Shield – featuring some of the world’s oldest rock and the deepest waters. Plus, on crisp autumn nights, the dancing flames of the Aurora Borealis light up the sky. Combine this with yogic, meditative, and community practices that enhance connection within and with others, we have the opportunity to create a powerful experience. Immerse yourself in the stunning, isolated beauty of the north country. Connect to your elemental nature. Blachford Lake Lodge – a unique fly-in resort – provides you with the chance to enjoy a pristine environment with comfortable facilities, wonderfully hearty vegetarian food and various activities all designed to connect to your elemental core. Discover the magic of the Canada’s north – the Aurora Capital of the world! Departing Yellowknife at 11 am on Thursday, September 13th, fly to Blachford Lake Lodge, a 25-minute charter flight, to arrive at the lodge for lunch. Located on a remote jewel of a lake set in Precambrian rock, this spacious, handcrafted log lodge offers a blend of rustic charm and modern comfort. Hearty vegetarian meals are prepared by a talented chef, and the cozy Aurora lounge offers a retreat in the evenings. Throughout our 4-day/3- night stay, enjoy a variety of activities: practice Yoga and meditation daily, embark on guided excursions by boat or head out on hiking trails; soak in the hot tub or relax in the sauna; and discover the awe-inspiring Northern Lights. Our stay concludes after lunch on Sunday, with our flight back to Yellowknife, arriving between 4 and 5 pm. 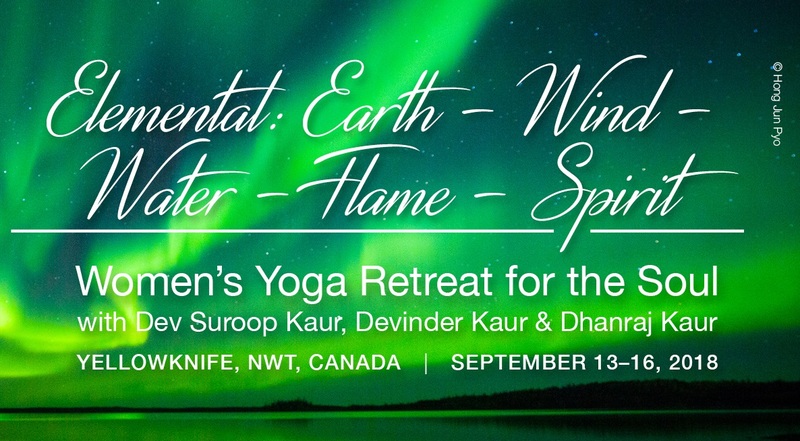 The retreat organiser is Maureen (Dhanraj Kaur) and she is located in Yellowknife. Please contact her directly to make arrangements for your stay and your payment. She can be reached by email at maureen@radiancembodiedyoga.com or call 867-445-5124.